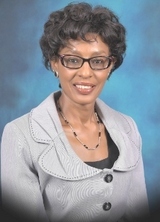 Prof. Lucy W Irungu is the Vice-Chancellor of Machakos University and a Professor of Entomology. She graduated from the University of Nairobi (UoN) with a BSc first class honours degree (Entomology) in 1978 from the Department of Entomology. She immediately joined ICIPE as a graduate research scholar and was awarded a scholarship by the Commonwealth Fund for Technical Cooperation to pursue an MSc degree in Medical Entomology and Applied Parasitology at the Liverpool School of Tropical Medicine which she completed in 1979. Prof. Irungu proceeded to Imperial College and the British Museum on internship for six months before returning to ICIPE. In 1981, she was awarded a scholarship by the Association of Commonwealth Universities (ACU) to pursue her PhD. She completed her PhD at the Liverpool School of Tropical Medicine in 1984 and returned to ICIPE for her postdoctoral work. Ms. Lorna Gathigia Mbatia holds a Master Degree from the University of Nairobi and a Post Graduate Diploma in Law from the same University. She has worked with several organizations serving in different capacities among them being. the founding Partner at CFL Advocates and the head of corporate Commercial law. She was an Associate Partner at MMC Africa Law in-charge of the Intellectual Property Department. She is a member of the following professional affiliations: Law Society of Kenya, Rwanda Bar Association, East Africa Law Society, International Trade Marks Association (INTA), Member of the Africa Global Advisory Council 2018-2019, Member of the Anti-counterfeiting Committee 2017-2018, International Trade Marks Association (INTA), Member of the Africa Global Advisory Council 2018-2019, Member of the Anti-counterfeiting Committee 2017-2018, Kenya Association of Manufacturers- Member of the Legal and Regulatory Committee, Pharmaceutical Trade Marks Group (PTMG). Ms. Mbatia possesses many Professional awards and citations: Listed in the 2012 – 2018 lists of the World Trade Mark Review WTR 1000, The world’s leading trade mark professionals, Recipient of the International Law Office 2014 client choice award for Intellectual Property (trade marks) in Kenya, Listed in the Managing Intellectual Property World IP surveys from 2014 – 2018 as an IP star and ranked in the reputable Chambers and Partners global guide from 2015-2018. She is a member of the Rotary Club of Muthaiga and New Life Home Trust- Local Advisory Committee. Representative of the CS, The National Treasury and Planning.